The best is yet to come. Really? Grace and peace to all of you from God our Father and our Lord and savior Jesus Christ! I’ve heard that people call Christians religious people. Have you? That’s so strange. Because Christian faith is anything but a religion. We are not religious people! Religion is when you make up your own ideas about this world, with God or without Him, about us, about how to live in this world, and then believe them contrary to what your senses, reason and experience tell you. We are realists, who base our worldview, our lives and our trust to God, who has revealed Himself in our history before the eyes of hundreds and thousands of eyewitnesses. How do you call the one who believes in a verifiable history? Realist. Right? As Christians we are probably the only people who realize what this world is about. Who we are. What is wrong with this world. For we know the answers. They were given to us by God. And the most important, they correspond to the reality. We can experience it. We can reason about it. That’s why we are realists. I was told that today’s topic will be “the best is yet to come”. Sounds really good. Do you know why is it beneficial to be a realist? Being realists make us both, more pessimistic that others, and also more optimistic than others, when he hear statements like this. Why? We know that this world was created by our benevolent and gracious God. Created good, indeed, very good. But now almost everything is corrupted by sin. We don’t need to go far to relate apostle Paul’s words to our lives. There are sufferings all around us. Different in kind… but they are inevitable part of our lives, in lives of our loved ones, and in lives of those whom we meet daily. Broken relations, destroyed families, abused children, who carry their pain and are angry to this world, injustice, poverty, sicknesses, inner conflicts, aggression from others, slavery to circumstances around us, financial struggles… we can probably go on and on with this list. “The best is yet to come…” As realists we are pessimistic. If we think that this world is getting better, that people are getting better, that we’ll be able to escape all the suffering, that we’ll soon reach the paradise… No, then we are more pessimistic than others. However, being realists helps us at the same time to be more optimistic than others. We just read: we have been justified… in the midst of this broken world we have peace with God through Jesus Christ. Through Him we have access to grace…and we can rejoice in the hope of the glory of God. That’s about us. About each of us. And that’s for real. Yes, we have difficulties. But we are not alone in them. This is where our realism and trust to God, who has so forcefully acted in our history, come forth and allow us to be optimists. Even if we are not in control of circumstances around us, we know there is the One, who is. And we have access to Him, we have access to His grace. Even in the middle of sufferings and difficulties we can rejoice for we know that God, who is in control of everything, is with us. That’s His promise, and He has proven to be faithful God. We experience His love, we experience His life changing power. We can have this firm hope because He has already given us His Holy Spirit, who brings joy and peace into our hearts. As realists we are optimistic. “The best is yet to come.” Yes, even if we cannot change the world, there are a lot of things we can change. We can daily grow in our appreciation of God’s gifts. We can grow in our joy realizing how much our Father in heaven does for us, how faithful He is and how important we are to Him. Each of us. You. Yes, you. Besides, there is an infinite number of opportunities for us to serve those around us. Our joy doesn’t depend on human approval, although, of course, it is important. But when we serve people around us, passionately, sacrificially, in all our relations, as our God serves us, then we have a joy that is a gift of God. Heavenly joy. Even in the midst of struggles. 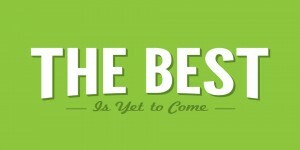 “The best is yet to come.” For us this statement is true in its fullest sense. We know that the best is yet to come. That is our firm hope. God has fulfilled everything He has promised. He promised that He will restore the goodness of creation, there will be no more sufferings, no more tears, only joy in His presence. On this day I’ll be out of job. But not you. Just imagine, schools without sin. Children as perfect and as beautiful as they could be, and you, teaching them God’s wisdom in His kingdom. The best is yet to come. That is our firm hope.